NEWFOUNDLAND – Anaconda Mining of Toronto has announced plans to expand the resources at its Point Rousse gold project in the Baie Verte Mining District. The first order of business is a 5,000-metre diamond drill program at three targets – expansion drilling at the Argyle deposit plus exploration drilling at the Anoroc and Deer Cove prospects. Anaconda will also conduct a 30-line-km ground magnetic and induced polarization geophysical survey. The Point Rousse project includes the fully operational 1,300-t/d Pine Cove mill and permitted tailings management facility. Anaconda feeds the mill with ore from the Pine Cove and Stog’er Tight mines. Argyle – which is currently in the permitting stage – will provide future ore. The Argyle deposit contains 38,300 oz. of gold in 543,000 tonnes grading 2.19 g/t gold. Drilling there will follow up on the high grade results from this winter’s drill program that included 12.47 g/t gold over 4.0 metres and 7.87 g/t over 7.0 metres in two holes. The Argyle deposit is located within the Scrape Trend as are the Pine Cove and Stog’er Tight deposits. The Anoroc prospect is about 500 metres west of the Pine Cove pit. Previous drilling include 2.68 g/t gold over 15.9 metres and 9.9 g/t over 2.0 metres in separate holes. The Deer Cove prospect has an exploration adit driven by Noranda when it tested a gold-bearing quartz vein. Historic drilling there intersected 22.74 g/t gold over 5.0 metres, 26.12 g/t over 3.6 metres, 29.60 g/t over 1.7 metres, and 24.39 g/t over 2.3 metres. 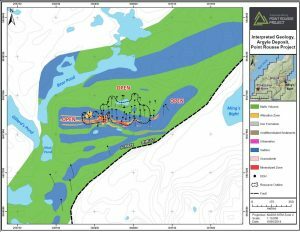 Anaconda believes the entire Point Rousse property is a good gold target where existing deposits can be expanded or new deposits drilled. Go to www.AnacondaMining.com to follow the company’s news.